In New York State there is no law requiring the government to notify the public when sewage is flowing into our waterways. New Yorkers are unaware of the frequency, volume and location of sewage discharged into the waters where we swim, paddle, boat and fish. 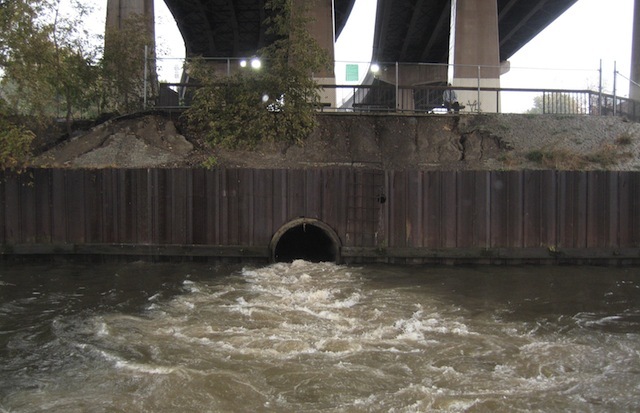 With hundreds of releases a year, discharging billions of gallons of raw sewage into our waterways, New York needs a public notification system that will protect the public health and support safe recreation for everyone. Permitted sewage discharges – like this one releasing into the Hudson in Troy, NY – release billions of gallons of raw sewage into NY waterways each year. More than a dozen states have a “Sewage Right to Know” law – New Yorkers deserve the same protection. Riverkeeper is working to pass a Sewage Right to Know Law for New Yorkers and we need your involvement! If you have an opinion or a story to share about sewage contamination in our waterways, and your right to know, please come out and speak at the upcoming NY State Senate Hearing on sewage notification, happening October 14th in New York City. We need New Yorkers to testify in person, submit written statements, and/or attend the hearing to show support for public notification. Learn more or RSVP to testify now. Everyone who supports government transparency on sewage releases should sign this petition in support of notification that will be submitted at the hearing. Let our elected officials know that we want access to the same water quality information they have access to so we can make informed decisions for ourselves and our families on where and when we get in the water. Learn more about Sewage Right to Know laws. Review waterborne illnesses caused by exposure to sewage. Riverkeeper’s report on sewage in the Hudson. These kids were unaware that they were swimming in highly sewage contaminated water before we reached them. They were swimming in the Hudson off northern Manhattan on the second day of a 3-day, 200 million gallon, sewage discharge, 7/21/11. Beacon: What happens when public notification is not required by law? Notification does not happen. Ossining: What happens when notification is only given for accidental releases? The public stays out of the water on the wrong days. New York City: What happens when we don’t test near public access points, or report all the discharge locations? The public does not get the full story and is exposed to contaminated water.